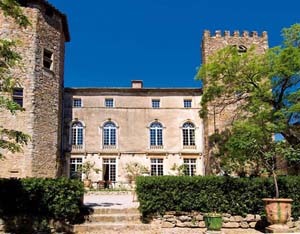 Château for sale, with walled grounds and two independant apartments in historic Medieval town in the South of France. It is south facing set into the side of a hill on the basement level. It is built to four levels. Over 1000 m2 of living accommodation over three floors. Over 2000 m2 of garden - park and terraces. Built by a local Count with exceptional taste and attention to detail. Walking distance to banks, post office, grocery and medical services. Situated in the foothills of the Pyrenees, a short drive from Spain, Andorra and Mediterranean beaches. This Maison de Maître was completed in 1851. South facing with a spectacular view of the Pyrenées the property is set in 1.5 hectares (3.7 acres). This country mansion has 7 bedrooms (ensuite). The property is located on the southern edge of a rural hamlet (population 320) in the beautiful Haute Pyrenées region of South West France. It can sleep 11. It is surrounded by farmland and wooded hillsides. The grounds also command dramatic views to the Pyrenées. The property has been comprehensively restored. The independant converted barn included in the sale has approximately 200m2 of habitable living space. It has been beutifully renovated maintaining original features and is currently very successfully let as a self-catering holiday home. There are three bedrooms, two shower rooms, a large sitting room, a luxury granite finished completely equipped kitchen dining room and a covered veranda with views of the Pyrenées. This is a genuine medieval castle located in a region famous for its history, weather, food and wine. Built between the 12th and the 16th centuries, this castle (known in France as a château fort) is located in the history-rich south West France and is easily accesible from Europe and the USA. The chateau is a medieval castle, recently refurbished, and now offering the utmost comfort and luxury, with an estate of 160 acres. The castle's recorded history dates back to 1354, although it may already have been centuries old. It has changed hands several times since then, being owned by series of siegneurs up to the French Revolution. In the twentieth century it was owned by a famous French singer and sold to its present American owners in 2000. Since 2001 a major renovation program has been undertaken so that today the castle is a comfortable residence, though retaining its medieval personality. It has immense potential both as a private residence and as a business. This is a charming château, dating from the eleventh century, though much changed over the centuries. It is now a comfortable private home. The location is exceptional and is known to have been sacred in prehistoric times. This romantic hilltop castle it is located just south of the Loire Valley, commanding views across the surrounding spectacular countryside. It is surrounded by gardens and terraces, and an orchard / paddock with a small barn. It has a large swimming pool. 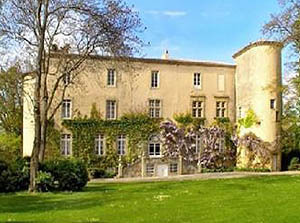 The château is currently for sale at 600,000 Euros. In 1210 it was seized and occupied by Simon de Montfort, whose soldiers captured the owner Raymond de Termes and held him in prison in Carcassonne. 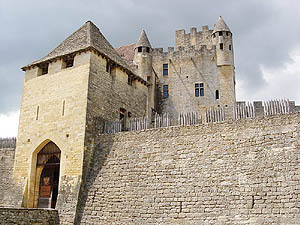 Militarily, the castle lay dormant for the next 30 years, until Raymond's son Olivier de Termes took back the castle in the brief revolt led by the young viscount Trencavel against the crusaders. Aguilar became the refuge of faidits, Cathar knights and lords dispossessed of their own strongholds. Albi is an ancient city in the south of France. 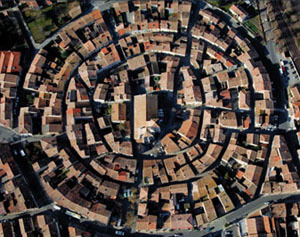 It preserves several distinct sites of walled cités from the Cathar period in the centre of the modern city. Although Albi was not besieged during the Cathar Crusade, it did give its name to adherents of Catharism - Albigeois or Albigensians, as the Caholic Church wrongly imagined it to be the cetre of Catharism in the Languedoc. 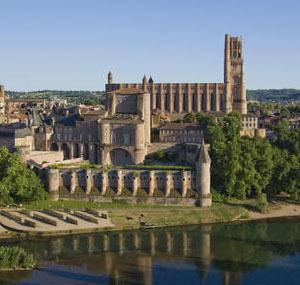 Albi is located on the River Tarn, in the Tarn departement, Midi-Pyrénées region, 85 km northeast of Toulouse. It was the seat of the Bishop (later Archbishop) of Albi and is the seat of the Diocese of Albi. The episcopal cité around the cathedral (in the center of the modern city), was added to the UNESCO list of World Heritage Sites in 2010. Along with Toulouse and Montauban, Albi is one of the main cities built in Languedoc-style red brick. The bishop's city, a walled area encompassing the bishop's palace and the cathedral) claims to be the largest surviving brick-built complex on earth. The Château d'Alogny is a romantic hilltop castle. A historic private home, it stands just south of the Loire Valley between the historic cities of Tours and Poitiers. 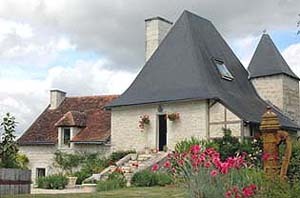 Alogny commands outstanding views across the surrounding countryside. It is surrounded by intriguing gardens and terraces, and has a large, private swimming pool. Originally built in the Eleventh Century, the castle retains its mediaeval ambiance without compromising comfort. Alogny's massive beams and ancient stone walls reflect its long history. 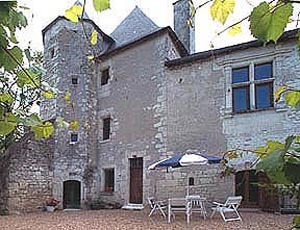 The Château is available for rent throughout the year, for vacations, and exclusive use. 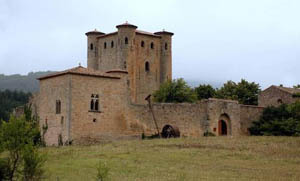 In the early 11th century the castrum of Arques belonged to the Abbey of Lagrasse. At some time during the next hundred years it passed into the hands of the Seigneurs of Termes. 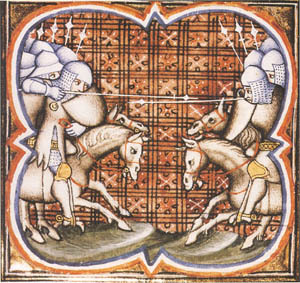 After the Crusades against the Cathars, and the fall of Termes, Arques was given to one of Simon de Montfort's lieutenants, Pierre de Voisins. It was later reclaimed by Oliver de Termes in 1246 following his surrender to the French Crusaders, but then sold it back to Pierre de Voisins. Avignonet is famous as the site of a massacre of a group of Inquisitors in 1242, part of a general uprising against the invading French crusaders. This event precipitated the final siege of Montségur and caused heavy penances to be laid on the population of Avignonet-en-Lauragais. The castle of Beaucare saw some of the most impressive action of the Wars against the Cathars of the Languedoc, including the turning point in the military career of the Crusade leader Simon de Montfort. Perhaps the most interesting aspect is a siege that took place here when Simon's troops were besieged in the castle by Raymond VII who held the town, while Raymond was himself besieged by Simon camped outside the town. We have vivid accounts of the action, including precious information on what siege engines were used and the countermeasures taken against them. 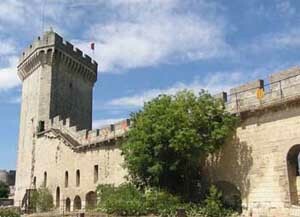 Today a rebuilt castle stands in Beaucaire, open to the public. The Château de Beynac is a castle situated in the commune of Beynac-et-Cazenac, in the Dordogne département of France. The castle is one of the best preserved and best-known in the region. This medieval castle, with its austere appearance, is perched on top of a limestone cliff, dominating the town and the north bank of the Dordogne River. Visitors to the castle can see sumptuous tapestries showing hunting and other scenes from the lives of the lords of the period. 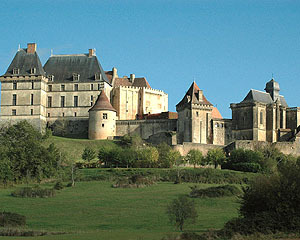 The Château de Beynac has been listed as a monument historique by the French Ministry of Culture since 1944. The village of Beynac below the chateau, also served as a location for the film Chocolat by Lasse Hallström, in 2000. 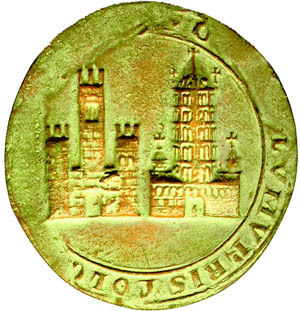 In the Middle Ages Béziers belonged to the Viscounts of Carcassonne. When the first Cathar Crusade arived in the Languedoc this was their first target. On 22 July 1209 the Crusader army arrived at Béziers on the periphery of the area in the Languedoc where Cathars flourished. There were believed to be around 200 Cathars in the town among a much greater population of sympathetic Catholics. The townspeople, believing their city walls impregnable, were careless, and the town was overrun while the leading Crusader churchmen and nobles were still planning their siege. Today nothing remains of the Viscounts' Castle in Béziers, but the town still bears scars inflicted by the Crusaders. It was here that the abbott-comander gave the famous command "Kill them all - the Lord will recognise His own"
The Château de Biron is a castle in the French commune of Biron in the valley of the Lède, a tributary of the Lot River in the département of Dordogne in Périgord, part of the Aquitaine. 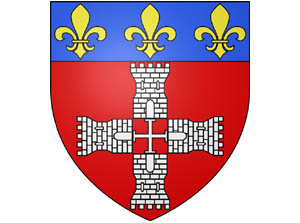 Biron was held by Cathars in 1211 and taken by Simon IV de Montfort the following year. The Plantagenets held it at times during the 14th and 15th century. Biron was erected as a duché-pairie in 1598, for Charles de Gontaut, created duc de Biron. The present château bears additions over the centuries that make it a picturesque ensemble: a twelfth century keep, sixteenth-century living quarters, a chapel and vaulted kitchens. 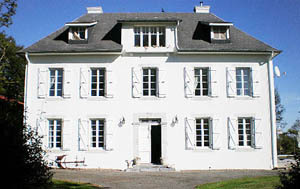 The commune purchased the Château de Biron in 1978, with a view to restoring the structure as a tourist draw. Since 1928, the Château de Biron has been listed as a monument historique by the French Ministry of Culture. 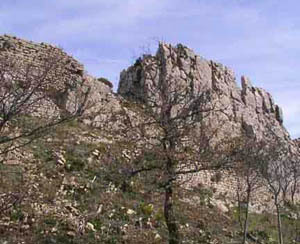 Bram was a castrum in the Languedoc, attacked by the army of the French Crusaders. Today there is no trace of the medieval fortifications there. When Bram fell in 1210, 100 prisoners had their noses cropped, their lips cut off and their eyes gauged out. One man was left with one eye so that he could guide the others away. With a hand on the shoulder of the one in front, and the one-eyed man at their head, a file of blind prisoners wound its way to Lastours (Cabaret), a visible demonstration of the ineffable mercy of God's Christian Army. Today, there is almost nothing to see at Bram remaining from the period, though the street layout preserves the pattern of a typical circular village. 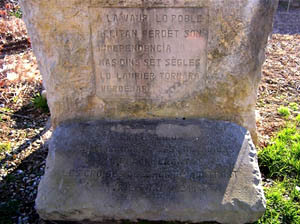 It lies in the Aude departément. The Château Comtal (Count’s Castle) is a medieval castle within the Cité of Carcassonne, the largest city in Europe with its city walls still intact. The Medieval Cité lies within the modern city of Carcassonne in the Aude department, of which Carcassonne is the prefecture, in the former province of Languedoc. 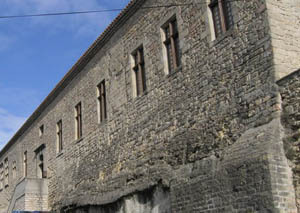 Although the outer curtain wall of the cité is French, and the whole site has been substantially restored, the Château Comptal has a strong claim to be called a "Cathar Castle". 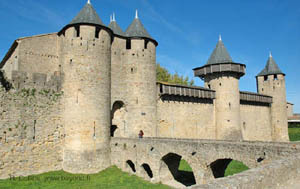 When the Catholic Crusader army arrived in 1209 they first attacked Raymond-Roger Trencaval's castrum at Bèziers and then moven on to his main stronghold at Carcassonne. 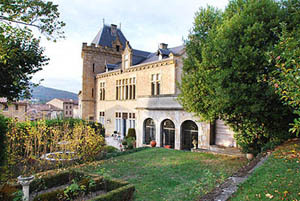 The castle was restored in 1853 by the architect Eugène Viollet-le-Duc. It was added to the UNESCO list of World Heritage Sites in 1997.You can visit the medieval cite (free) and the Château Comtal (entry fee). The castrum was comanded by Raymond and Bernard de Roqueville, who held it under the suzerainity of Raymond VI, Count of Tououse. The Crusaders went on the besiege Montferrand, Comanded by Baudouin, brother of the Count of Toulouse. Castelnaudary is a commune in the Aude department in the Languedoc-Roussillon region in south France. It is in the former province of the Lauragais and famous for cassoulet of which it claims to be the world capital, and of which it is a major producer. Châlus is a castle in commune of the same name the Haute-Vienne department in the Limousin region in western France. While besieging Châlus in 1199, Richard I of England was mortally wounded by a crossbow bolt shot by one Pierre Basile. King Richard's bowels are still preserved in the chapel here. 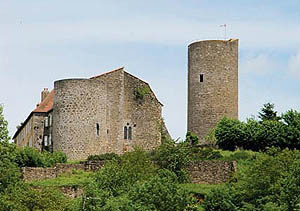 In 1275-1280, Géraud de Maumont built a second castle in front of Châlus Chabrol, called Châlus Maulmont. This was largely dismantled in 1790, then used as prison. The tower of Châlus Maulmont collapsed in 1994. There is a medieval garden here. Other attractions of the village include a museum dedicated to the chestnut. 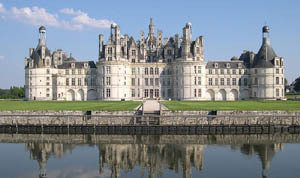 The royal Château de Chambord is one of the most recognisable châteaux in the world. Its architecture is distinct French Renaissance that blends traditional French medieval forms (such as its plan) with classical Italian structures, as seen in the facades.. The Château de Chambord was an expression of François' I desire for power and extravagance and was designed to confirm his status as one of the greatest revolutionary builder's of his age. Chambord is the largest castle in the Loire Valley, yet was built as a mere hunting lodge for King François I, who maintained his royal residences at Château de Blois and at Château d'Amboise. It is open to the public. The ruined chateau and modern village of Coustaussa is situated in the high valley of the Aude, above the river Sals between Arques and Couiza. On their way back from Termes in late November 1210, Simon de Montfort and his Crusaders found the Château at Coustaussa already abandoned, and so carried on to Puivert. Apparently the garrison at Coustaussa, like the one at Le Bézu had lost heart after the fall of Termes. Picturesque but dangerous ruins. Free entry. 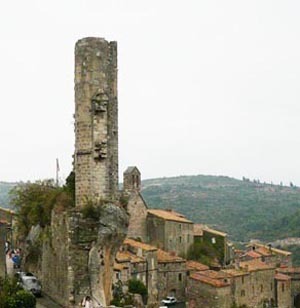 Fanjeaux (Occitan: Fanjaus) is a village and commune in the Aude department of the Languedoc. 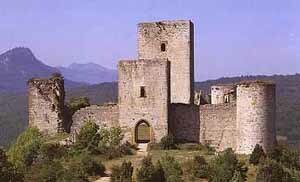 In the medieval period Fanjeaux was a large castrum in the Lauragais and an important centre of Cathar belief. It was then surrounded by a moat and defended by ramparts with fourteen towers ("tours"). Two entries serve as reminders of the medieval gates which controlled entry into the town. Like most Languedoc castra it had a large castle (Château fort) within its walls - considered a "paradise" by one troubadour. Almost nothing of it remains today. 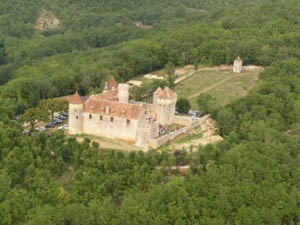 In 1204 Esclaremond de Foix received the Cathar Consolamentum at the Château here in the presence of her brother, the Count of Foix. The site of the Château hall where the ceremony took place is now marked by a Catholic Dominican chapel, supposedly marking the site of one of Saint Dominic's miracles. You can trace the old city walls and surrounding dry moat, now marked by a road. An outbuilding belonging to the new Château (13th century) also survives and according to a dubious Dominican tradition once served as Saint Dominic's Fanjeaux residence. 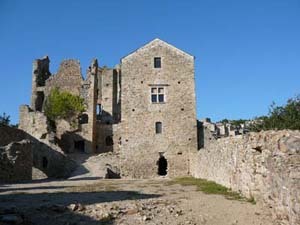 The Château Saint-Pierre de Fenouillet is a ruined castle in the village of Fenouillet, Pyrénées-Orientales, Languedoc-Roussion. It is also known as The Château de Fenouillet, or the Château Saint-Pierre. In the Middle Ages, the Château Saint-Pierre Fenouillet was the seat of the Viscounts of the area around Fenouillet, known then and now as the Fenouillides (Fenolheda). The Viscounty was claimed at various times by the Counts of Carcassonne, Cerdanya, Besalù, Roussillon, Narbonne and Barcelona. Fenouillet lay at the centre of important networks, geographic, military and social. The position controls access to mountain valleys. 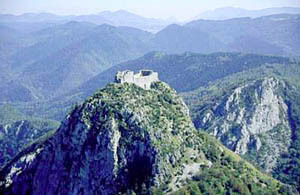 The castle here provided a military headquarters most notably during the Cathar period. 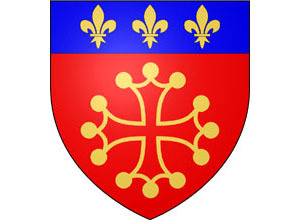 The Viscounts of Fenouillet also occupied an important position, with influence beyond Carcassonne and Barcelona. 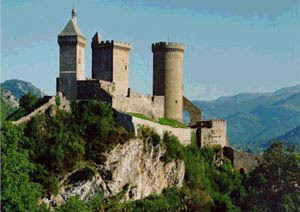 It also served as a refuge to faydits, disposed Cathars with nowhere else to go. Nearby are two other castles Sabarda and Castel-Fizel, protecting access. 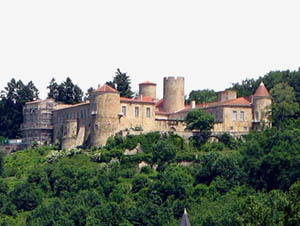 The Château de Foix is a castle in the French département of Ariège. An important tourist site, it dominates the town of Foixit and was once a Cathar Castle. It is listed as a monument historique by the French Ministry of Culture. It was the home of the celebrated family of counts who became the viscount of Béarn, then kings of Navarre andkings of France.. In 1002 the castle figured in the testament of Roger the first count of Carcassonne who bequeathed it to his eldest son Bernard. Bernard Roger is the first to use the title Comte de Foix. The castle was the count's maion residence until 1290. 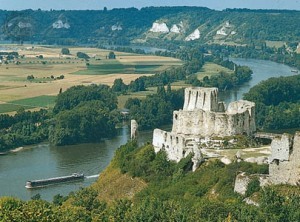 Château Gaillard is a ruined medieval castle in Normandy, France. It was built built in limestone c. 1196–1198 by the master military strategist Richard I (Richard Coeur de lion, the Lionheart). Some historians think that he designed it himself. It was an early Concentric castle and one of the first to feature machicolations, and flanking towers. The castle consists of three enclosures separated by dry moats, with a keep in the inner enclosure. It was lost to the French by the incompetent King John and played a major part in the Hundred Years' War, exchanging hands several times. It was slighted in 1599–1611, and is now in ruins. The ch�teau Gaillard can be visited throughout the year. The keep is open in summer paying. Guided Tours in English, French and German from mid March to Mid November. Parking available. 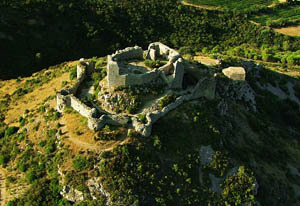 Built on a rocky spur, the original fortress of Hautpoul, overlooks surrounding valleys and controls access to the Black Mountains. The original castle here was supposedly built in 413 by the Visigoths on the side of a mountain, defended by almost inaccessible cliffs. 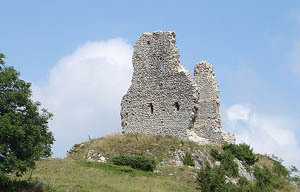 This fortress controlled the Arnettte and the Thoré valleys, overlooking the plain where the town of Mazamet now stands. Hautpoul takes its name from the contraction of alto pullo, roughly "high-chicken" or perhaps "high-perch". 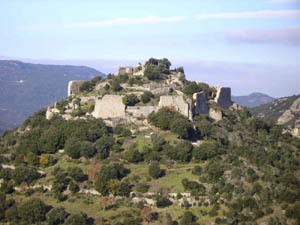 The castle and town was besieged by Simon de Montfort in 1212 during the Crusade against the Cathars of the Languedoc. It fell after four days, but the survivors seem to have returned to Catharism as soon as the Crusaders left. It was besieged again during the wars of Religion between Catholics and Huguenots. Today only vestiges of the medieval castle remain. 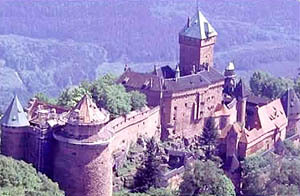 The château du Haut-Knigsbourg is located at Orschwiller, Alsace, France, in the Vosges mountains just west of Sélestat. The castle is nestled at a strategic location on a high hill overlooking the Alsatian plain; as a result it was used by successive powers from the Middle Ages until the Thirty Years' War when it was abandoned. In 1900 it was restored under the direction of Emperor Wilhelm II. Today it is a major tourist attraction, located on the Alsace wine route. An unusual arrangement of three castle towers (Las Tours, The Towers) this fortification belonged to the Lords of Cabaret, who held in fief from the Trencavels. In the thirteenth century there were three towers here, built on the same rocky outcrop. They are called Cabaret (to the north), Quertinheux and Surdespine (to the south). These are some of the few original Cathar castles left. The Seigneurs of Cabaret received troubadours here, including Raymond de Miraval and Peire Vidal, who dedicated verses to the Cathar Ladies of the place. In March 1211, during the wars against the Cathars of the Languedoc, Lavaur was besieged by Simon de Montfort. The town fell on 3rd of May, 1211, following which the French Catholic Crusaders excelled even themselves in cruelty and disregard for the accepted rules of war. The head of the garrison, Aimeric-de-Montréal, was hanged along with his knights. His widowed sister, the chatelaine of Lavaur, Gerauda (or Geralda) de Lavaur, was brutally murdered. Today nothing remains of the Medieval Castle, but you can visit a memorial commemorating Lady Gerauda' s murder and the loss of indendependance of the people of Occitania, and also a Cathral built to mark the Catholic victory. 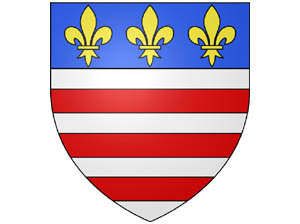 Marmande was a bastide founded about 1195 on the site of a more ancient town by King Richard I (Coeur de Lion or Lionheart). It had passed into the hands of the counts of Toulouse, and was besieged three times during the Cathar crusades. Prince Louis (the future King Louis) arrived with 20 bishops, 30 counts, 600 knights and 10,000 foot soldiers, having joined the army of the Pope's legate Abbott Arnaud Amaury. The city of some 7000 people fell after the first assault, and was sacked. The victors held a council and decided to follow Old Testament teaching - that men, women, old people and children should be executed. The massacre that followed shocked even the crusaders' own allies. Today nothing remains of the chateau here and very little of the city walls. Minerve is located on above the River Cesse in a naturally strong defensive position. Near the village the river disappears underground in a large, natural tunnel. There are a few vestiges of the medieval castle remaining and some moving monuments to the Cathar martyrs. 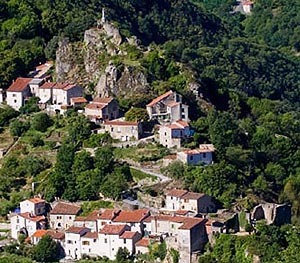 Montaillou is a small village in the remote Sabarthès area where Catharism was revived in the fouteenth century. 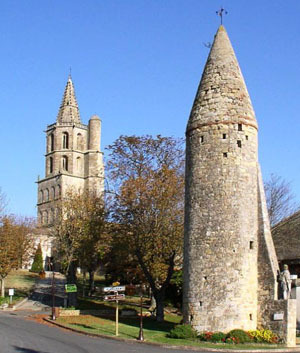 In 1318 the whole village was arrested on the orders of the bishop of Pamiers, Jacques Fournier, who had been the Cistercian Abbot of Fontfroide and who now felt a vocation as an Inquisitor. Exceptionally, he was interested in the truth about Catharism, and he kept records of the interrogations. Even more exceptionally, years later he was elected Pope (Benedict XII) so his records were preserved in the Vatican archives. These records form the basis of a book about the village by Emmanuel Le Roy Ladurie. 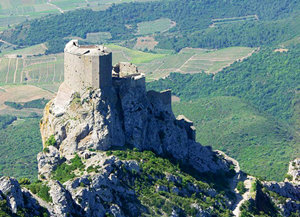 The Château de Montségur is probably the best known of all Cathar Castles. 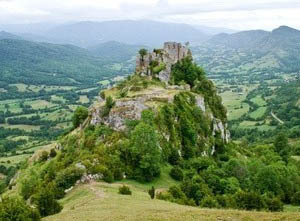 It is famous as the last Cathar stronghold, which fell after a 10 month siege in 1244. A field below the hill-top castle is reputed to be where over 200 Cathars were burned alive, having refused to renounce their faith. A building on this site sheltered a community of Cathar women at the end of the twelfth century. Early in the thirteenth, Ramon de Pereille the co-seigneur and Chatelain, was asked to make it defensible, anticipating the problems to come. It is open to the public, as is a museum in the nearby modern village of Montségur. There is an entrance fee for both. The Crusader army of Simon IV de Montfort defeated the Aragonese and Catalan forces of Peter II of Aragon, who had come to the aid of the Occitan forces of his vassal Raymond of Toulouse. Muret is a commune in the Haute-Garonne department in southwestern France. Today It is an outer suburb of the city of Toulouse, though it does not belong to Greater Toulouse, which it declined to join. It lies southwest of Toulouse and is the largest component of the intercommunality of Muretain. Today there is no vestige of the Medieval castle there. 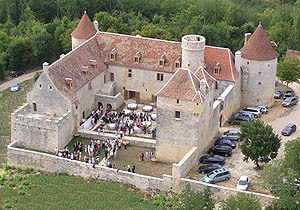 The Chateau de Pechrigal is a medieval castle with a majestic entrance. The castle has a distinguished history under the Séguy family under the ancien regime. It passed to the Perie and Dreyffus families and then to Léo Ferré one of the greatest composers and writers of French songs in modern times (ranked along with Georges Brassens and Jacques Brel). Built in the 14th century the Chateau has recently been completely renovated, and is available for exclusive hire, weddings and other family events, vacations and corporate events. Peyrepertuse is a ruined fortress and one of the Cathar castles of the Languedoc located high in the French Pyrénées in the commune of Duilhac-sous-Peyrepertuse, in the Aude département. It was associated with the Counts of Narbonne and Barcelona. It stands at 800m high. 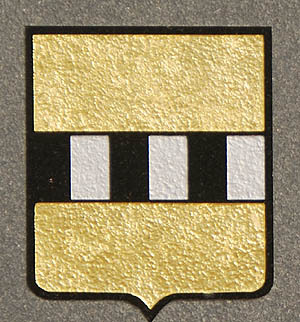 The name of Peyrepetuse derived from Occitan and means Pierced Rock. The castle was built on a strategic location by the kings of Aragon (lower) in the 11th Century and by Louis IX (higher) later on. The two castles are linked together by a huge staircase. The castle lost importance as a strategic castle when the border between France and Spain was moved in 1659, causing the castle to be abandoned. The Château de Pierrefonds castle situated in the commune of Pierrefonds in the Oise département of France. It is on the southeast edge of the Forest of Compiègne, north of Paris, between Villers-Cotterêts and Compiègne. Louis-Napoléon Bonaparte (later Napoleon III of France) visited the castle in 1850. As emperor, he asked Viollet-le-Duc in 1857 to undertake its restoration. Inside, Viollet-le-Duc produced more a work of invention than restoration With the exterior he showed his extensive knowledge of the military architecture of the 14th century. 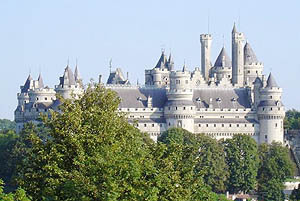 The Château de Pierrefonds includes most of the characteristics of defensive military architecture from the Middle Ages, though it underwent a major restoration in the 19th century . The Château is classified as a monument historique by the French Ministry of Culture. This is an exception. 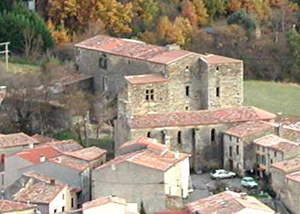 If you want to see what castles looked like in the Cathar period, pay a visit to the village of Pieusse, near Limoux. Although you will find it in no tourist literature, this is the most representative "Cathar Castle" still standing. Château du Plessis-Bourré is a Château of the Loire Valley in France, situated in the commune of Écuillé in the Maine-et-Loire department. Built in less than 5 years from 1468 to 1472 by Finance Minister Jean Bourré, an advisor to King Louis XI. It was acquired by Reille-Soult de Dalmatie family in 1911 and classified as a Monument historique in 1931. It was managed by Bruno & Antoinette de Ferrieres de Sauvebeuf from 1978 until January 2009. 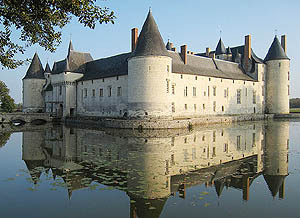 Le Plessis-Bourré until 2009 remained one of the few french castles inhabited by its owner. With the retirement of Bruno & Antoinette, Aymeric d'Anthenaise took over helped by Jean-Francois Reille-Soult Dalmatie. It is open for visits to the public. 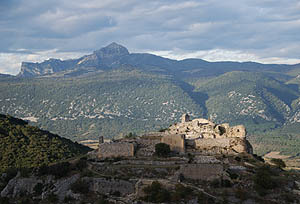 The Château de Puilaurens (Occitan: lo Castèl de Puèg-Laurenç) is one of the Cathar Castles of the Languedoc in what is now the South of France. It is located in the commune of Lapradelle-Puilaurens in the Aude département. 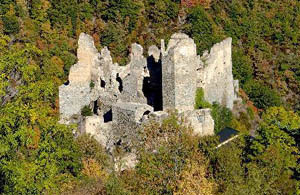 The castle stands on a spur of rock above the Boulzane Valley and the villages of Lapradelle and Puilaurens. There is a path from Axat to the castle. 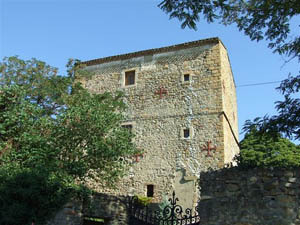 The castle here had belonged to the Abbey of Saint-Michel de Cuxa before it was acquired by the King of Aragon in 1162. As Aragonese property it was outside the territory ravaged by the Crusaders during the Cathar wars. Like Queribus it therefore provided a refuge for those fleeing from the invading forces. Those who took refuge there included both Cathars and faidits, that is to say those who had forfeited their property because of their opposition to the invaders. These faidits included high nobles, such as Guillaume de Peyrepertuse. 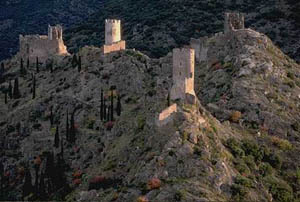 The Château de Puivert is a Cathar castle situated in the commune of Puivert, in the Aude département of the Languedoc. This building, on top a hill overlooking the village and its lake, reaches an altitude of 605 m.
In the twelfth century a castle stood on this site, which had strong Cathar and troubadour links. A meeting of troubadours took place here in 1170, and in 1185 festivities attended by the Viscount of Carcassonne and Loba, Lady of Cabaret. The castle has been listed as a monument historique by the French Ministry of Culture since 1902.The castle of Puivert is still in relatively good condition. It is privately owned, but open to the public and undergoing restoration. This is sometimes regarded as the last Cathar stronghold. In a sense it was. 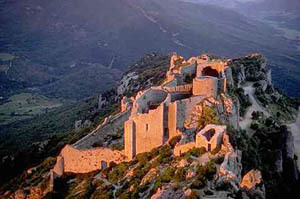 After the fall of the Château of Montségur (Occitan Montsegùr) in 1244 surviving Cathars gathered together in the Corbières in another mountain-top stronghold on the border of Aragon (The present border between the Aude département and the Pyrénées-Orientales département). Quéribus is high and isolated. It stands on top of the highest peak for miles around. From a distance it can be seen on the horizon, pointing up into the sky. It is accessible to visitors. You can drive almost to it, walking just the last few hundred metres. The entrance to the castle itself is very steep and narrow – a defensive measure. Notice the number of arrow loops covering the approach. The Château de Ravel is a castle situated in the commune of Ravel, in the département of Puy-de-Dôme, France. The Château de Saissac is a semi-ruined Cathar Castle on a promontory at the southernmost tip of the commune of Saissac, in the Aude département located north-west of Carcassonne. 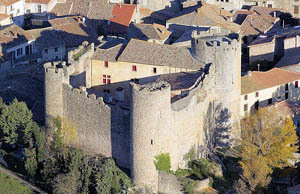 The village of Saissac and its castle (or château fort) dominates the rocky headland and the ravine of the river Vernassonne, overlooking the plain of Carcassonne at an important strategic position at the entry of the Black Mountains (Montagnes Noires). Today the ruins are protected as official historical monuments of France (monument historique). 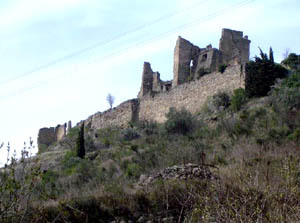 The Château de Termes is a ruined castle near the village of Termes in the Aude département of the Languedoc. Built on a promontory it is defended on three sides by deep ravines. The ruins of the castle cover an area of 16 000m². 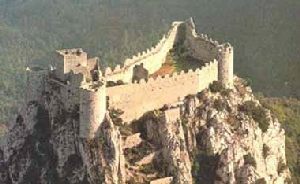 Held by Ramon (Raymond) de Termes during the Cathar War , the castle fell to Simon de Montfort after a siege lasting four months, from August to November 1210, the hardest siege of the first period of the Albigensian Crusade. Termes was a powerful castle sited on top of a large natural hill in the Corbières (in the present departement of the Aude département but then part of the County of the Razès). It consisted of a citadel within town walls (the castrum) and with a suburb (burg) next to it with its own defensive walls. Like the Château of Montségur ( Montsegùr) it was protected by a separate forward outpost - this one called Termenet. The castle is open to the public. Like most towns, Toulouse was defended by city walls with a seigniorial castle providing a second line of defence. The castle of the Counts of Toulouse was on the west side of the city, and known as the Château Narbonnais. The City was repeatedly besieged, and repeatedly withstood the Catholic Crusaders, though it had to be surrendered under treaties of surrender. On 12th September 1217 Raymond VI of Toulouse re-entered the City of Toulouse to the delight of the population, trapping Simon de Montfort's wife family within the Château Narbonnais. Simon himself died here the following year while besieging the city for a third time - to the great rejoicing of the population.. The Château Narbonnais survived the Crusades but was dismantled in 1549. The Palaise de Justice now stands on the site. Archaelogical excavations have revealed some of the foundations of the old Counts' Chateau. You can find much of the city's history commemorated by art in the Capitol in the heart of Toulouse. The Grand Trianon was built in the northwestern part of the Domain of Versailles at the request of Louis XIV, as a retreat for the King and his maîtresse en titre of the time, the marquise de Montespan, and as a place where the King and invited guests could take meals away from the strict étiquette of the Court. Begun in June 1687, the new construction (as we see it today) was finished in January 1688 and inaugurated by Louis XIV and his secret wife, the marquise de Maintenon, during the summer of 1688. 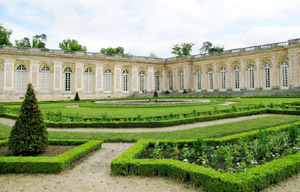 The Grand Trianon is set within its own park, which includes the Petit Trianon (the much smaller château built between 1762 and 1768 during the reign of Louis XV). Upstream from Axat in the Aude Gorge, carved out of the foothills of the the high Pyrenees, is the little known castle of Usson. It dates from the eleventh century (perhaps earlier) and during the Cathar period marked the eastern boundary of the territories of the Counts of Foix. In the twelfth century this was the capital of the Donezan region. Before the Défilé was cut through the mountains to link Quillan to Axat, this was an inaccessible outpost providing succour for faidits and other persecuted Cathars. The Cathar bishop of Toulouse Guilhabert de Castres is known to have taken refuge here. 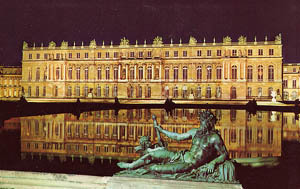 The Palace of Versailles (or Château de Versailles) is one of the most spectacular achievements of 18th-century French art. The site began as Louis XIII’s hunting lodge before his son Louis XIV transformed and expanded it, moving the court and government of France to Versailles in 1682. The three French kings who lived there until the French Revolution each added improvements. In the 1670s Louis XIV built the Grand Apartments of the King and Queen, including the Hall of Mirrors. The Chapel and Opera were built in the next century under Louis XV. The château lost its standing as the official seat of power in 1789 but acquired a new role in the 19th century as the Museum of the History of France. Versailles has been on UNESCO’s World Heritage List for 30 years, famous not only as a building, but as a symbol of the system of absolute monarchy of the Ancien Régime. The castle, in the middle of the present village, had belonged to the Archbishops of Narbonne until it was seized by Simon de Montfort and given to one of his lieutenants when nearby Termes was taken in 1210. It was here that the last known cathar parfit, Guilhem Belibaste, was burnt alive in 1321. The castle is open to the public and medival feasts are held here in the summer.